Freed in recent years from academic commonplaces and interpretative strictures, string quartets seem increasingly emboldened to develop distinctively recognizable voices. The Doric Quartet, one of the top such ensembles currently resident in England, brought to a private concert on Beacon Hill (which this writer had a hand in presenting) a stylistic idiom that hearkens back to the era of the great Josef Suk the elder and his Czech Quartet in the 1920s. The qualities one can hear in the best recordings of that legendary foursome may sound quaint, foreign, and distant, but at the same time, the open minded can find the approach inevitable in the right repertoire. The playing is characterized by avoidance of vibrato except as an expressive device, artistic application of portamento, and a delicacy of pianissimo which completely shuns the hard sell so prominent today in the most commercially successful ensembles. At the reception following the concert it was not at all surprising to hear how familiar the group was with the rare Suk discs. I had been waiting for many years to hear this sound reborn. A regular visitor to Wigmore Hall, the Doric made a highly acclaimed American debut with recitals at the Frick Museum in New York and Library of Congress in Washington in 2010. It is currently in the middle of its 6th annual tour to North America which includes stops in Philadelphia on April 5th and Providence on April 6th with some of the same repertoire discussed herein. From the opening notes of the Haydn: String Quartet in B Minor Op. 64, #2 no doubt existed that a cunningly brilliant interpretation had begun. The affect in the 150-seat library transcended the mere transparency of a gut-stringed early music group through the quartet’s applications of the colors and variety that only modern instrumentalists un-girdled by doctrinaire considerations can produce. Haydn’s distinctive wit and surprising complexity emerged anew to the seasoned audience. Beyond the artful portamento-rich and sometimes vibrato-less style of the 1920, the Doric foursome supplied perfection of intonation that the earlier recordings lacked. The many surprising moments included some highly original left-hand-pizzicatos, a democratic approach of seamlessly shifting dominance of parts and niceties of accent and expression that were entirely their own. Furthermore, they achieved bright, clear and steady pianissimos at the threshold of audibility without ever having resorted to mutes. After 10 years of togetherness (only the violist is newish), this quartet could still offer the freshest and most convincing Haydn playing we have heard. Many Chandos recordings support this testimony, but I suggest that the example below most immediately encapsulates the connections with the Suk style. Despite its origins in 1933 Vienna, Korngold’s String Quartet No. 2 in E-flat Major Op. 26 in no way anticipated marching brownshirts. Its sunny disposition could only have come from a cosseted former child prodigy who could still believe in the glories of an established order. At some moments the work foreshadowed Errol Flynn’s Technicolor smile in the 1938 Hollywood Robin Hood, while at others it hearkened back to “Marietta’s Lied” from Die Tote Stadt. The work concludes with a deranged waltz that reminds one of Baron Och’s “Ohne mich” from Rosenkavalier. Alex Redington and Jonathan Stone, violins; Hélène Clément, viola; and John Myerscough, cello, never smeared the exuberant architecture mit schlag. In this performance, Korngold’s post-romantic effusion possessed a clarity of charm which showed him to be an heir of Haydn. Even though Schubert’s Quartet in G Major, D. 887 commands a view from the highest pinnacle of string quartet literature, or any literature, for that matter, it can sound relentless in lesser performances. The Doric centered in a soulful quietude and tenderness while resisting the temptation to climax too well and too often; this made for an unforgettable performance. The foursome’s complex interplay of voices and sensitivity to harmonic and rhythmic nuance justify this ensemble’s placement on the very top echelon. This was a fine example of where instruments may have a big impact. 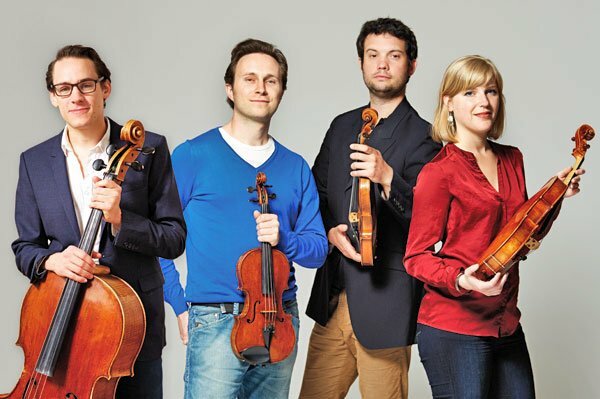 The difference in sound between them and the recent visit to the same venue by the Brentano Quartet was remarkable…I was sitting in the exact same position toward the back of the small and notoriously dead hall. The first violinist played a Venetian violin. They are well known for sweet sounds that often don’t project all that well (in contrast to the famed cellists the Venetians created). The second violinist had a Neapolitan violin that projected much better, was less refined, and was quite dark, which worked well. The violist played a modern instrument that projected and sounded well. The cellist played a 10 year-old modern German cello that was pleasant, but to my ear had little character and poor projection. By contrast, the Brentano played on four remarkable old Italian instruments, three of which are Cremonese (a famed Amati viola, and two late Strads) and a cello by one of the two or three greatest cello makers, Goffriller, who worked in Venice but was born in the Tyrol. A playing field for quartets that is far from level! Agreed that the Czech Quartet example supplied in the review sounds “quaint, foreign and distant.” And the portamentos were there as well. Try as I might, however, I failed to hear, at least in this example. the “avoidance of vibrato except as an expressive device.” To this ear they were vibrating their socks off. Then again, the supplied clip was not 18th century music. It would be fascinating to hear the Suk’s Haydn or Mozart to see if they reined in their vibrato a bit. Unless I missed it, the only examples on Youtube were of Dvorak and Smetana. Did they record earlier music? The invaluable recordings by the Bohemian Quartet (also known as the Czech Quartet) have not been available on CD since Biddulph editions went out of print more than a decade ago. My Parnassus label is attempting to resurrect them. I’m having difficulties finding a replicator who can make an 81 minute disc for me (that’s the three major recordings of Smetana, Dvorak, and Suk Quartets) although I have a satisfactory master disc. Eventually this problem will be solved. It might be possible to put those recordings along with the 12 additional minutes of Dvorak onto one DVD Audio disc. I’ve just issued my first DVD Audio, of Richter playing the entire Well-Tempered Clavier live. We’ll see how that sells. 1. Why would any “seasoned audience” member be surprised by the complexity of Haydn’s music? Any “seasoned audience” worth its salt would expect complexity (among other wonderful things) from Haydn’s art. 2. How does one go about getting an “invite” to the next Beacon Hill private concert. It sounds like fun.